WHEN WAS THE LAST time you played a guitar? Really played it? Not just picked it up and plunked a couple of notes on it'? Not since last August. Do you just walk by and pick it up once in a while? Every once in a while. But I lost all my calluses, and I hardly have any facility left now. Do you plan to give it up altogether? Well, the only thing that might push me back into playing again is when they get that guitar interface for the Synclavier in September. I just got fed up with playing because what I do is just so useless to normal consumption. I felt that I was banging my head against the wall for no reason, so I didn't have any desire to play. Did you try any other guitar synthesizers? No. The only reason that I'm thinking about the Synclavier is because you can load in the music writing part of it with the guitar, not because you can get great guitar sounds or anything. It's just that ordinarily if you want to load a melody into a thing, you have to have either keyboard technique or computer typing skill in order to load alphanumerically, but they have a new guitar interface that's coming out where you can play your lines and it stores them in the computer. Will it be able to play it back? Oh, yeah, it plays it back, but it won't sound like the guitar unless you store a guitar sound. You can store a guitar sound in there by sampling, and make it play back, but basically it allows a person who doesn't play keyboards to do all the compositional functions. Right now, it's not, but it will be. What you ought to do, if you want information on that is get in touch with Brad Naples at New England Digital. He can give you all the specs on it. Pat Metheny's got one that he's been touring with. Do you think something like this might end up making the guitar an unnecessary instrument? No way. Because it doesn't sound like a guitar. What it enables the guitar player to do is have other sounds come out. In other words, you can set up the synthesizer to be vibes or bells or whatever, and then play those lines on the guitar. But you wouldn't be able to get the same kind of inflection. There's a lot of drums and percussion on the Zappa, Vol. 1 With The London Symphony Orchestra album, but no guitar at all. Well, it wasn't supposed to have any electric instruments on it. Was that the intent at the outset? Right. There's no amplified instruments on there. It's all acoustic. That's just what the music was supposed to be. It wasn't supposed to be an electric band backed up by the London Symphony Orchestra. Were you trying intentionally to avoid a rock identification? The problem is, any time somebody from rock and roll does anything with an orchestra, it's polluted by the rip-off type stuff that's been done in the past you know, with three or four guys playing fuzztone crap while the whole orchestra plays whole notes in the background, and then every 18 bars goes da da to daaah! Everybody has this picture of rock and roll vs. symphonic-fusion stuff. I didn't want to have anything to do with that. That's not what the intent of the album was. When you were composing the actual pieces, did you find yourself approaching any of the melody lines from a guitaristic mentality? The last movement of "Sad Jane," kind of a marching thing, is actually a transcription of a guitar solo from the Shrine Auditorium, 1968, that Ian Underwood wrote out back then, and I came across one day in a pile of papers. I played it on the piano and liked the tune, and proceeded to orchestrate it. But otherwise, did you approach, say, the violin parts in that manner? 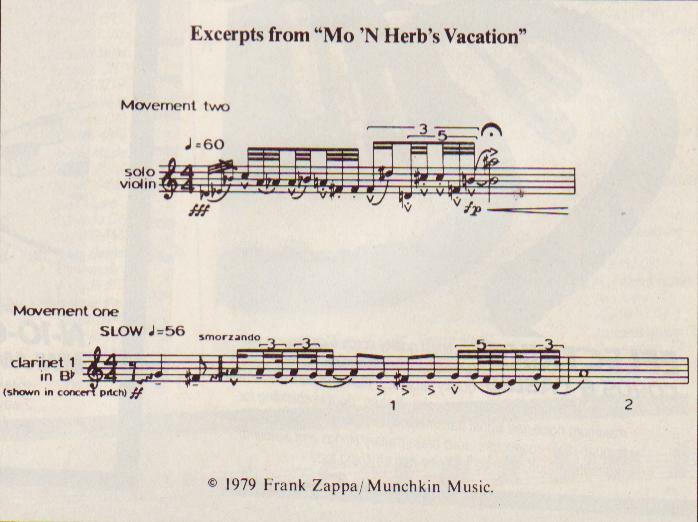 The violin solo figure, the theme for the second movement of "Mo 'N Herb's Vacation," was a lick that I used to play in that band with [bassist] Patrick O'Hearn and [drummer] Terry Bozzio. I would use that during the solo in the "The Sheik Yerbouti Tango" [Sheik Yerbouti, Zappa, 2-150 1] or "Little House I Used To Live In" [Burnt Weeny Sandwich, Bizarre, 6370] songs we played during that era. 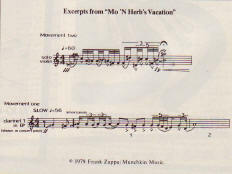 The opening phrase of the first movement of "Mo 'N Herb's Vacation," the clarinet figure in the front, was from a guitar solo recorded at the Palladium, Christmas, 1976, from a big band version of "Cruisin' For Burgers" [Uncle Meat, Bizarre, MS-2024]. A lot of things start off on the guitar, but wind up being orchestrational events that could never be played on a guitar. They just got out of hand? It's not that they got out of hand. Guitars do have their limitations. There are certain types of melodies and rhythms that wouldn't come out if I made up a tune on the guitar as opposed to making it up on piano. Just because of the tuning of the strings in fourths and so on? No, just because of the way my hand goes on it. Like if I play piano, I have so little technique that I don't usually write the real tangled-up rhythms on the piano because it's hard for me to play them, but it's the other way around if the melody started off on the guitar in the first place.